Mobile guru and king of mobile statistics, Tomi T. Ahonen has just published a new book. 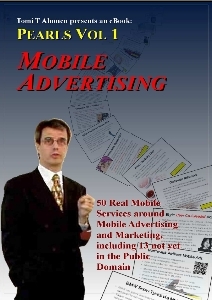 Titled “Tomi Ahonen’s Pearls Vol 1: Mobile Advertising“, it’s Tomi’s first book to be published as an eBook. If you’ve read any of other Tomi’s books or heard him speak you are no doubt familiar with his concept of mobile “Pearls”. Pearls are unique, innovative and generally highly successful mobile service concepts. Tomi first started collecting Pearls in 2000 when he was at Nokia and has amassed over 1200 of them which he uses extensively in his books and presentations. The new book is a collection of the 50 best mobile advertising Pearls of all time . It starts with the first mobile ad campaign ever, which was an ad supported SMS news headline service launched in Finland in 2000 and ends with Puma’s free advergame for the 2008 Shanghai Grand Prix formula one race. In between are 48 other mobile advertising stories including 13 never before publicly presented. The results of some of these campaigns are quite amazing including an SMS campaign with a 98% response rate and another where users complained when they didn’t receive enough ads. There are Pearls about well known services like Flirtomatic, Blck and Admob but also many on little known, but highly successful regional campaigns. Pearls Vol 1, at 119 pages, is a quick and lively read that offers plenty of ideas for anyone in mobile publishing, development, advertising or marketing. Reading Pearls might very well inspire you to create the next highly successful mobile service or campaign. The book is available only in electronic form as a DRM-free PDF. You can read it on your computer, print it out or do what I did and read it on your phone. I used the free MobiPocket Reader software, which does a great job of converting and synching the PDF’ to Symbian, BlackBerry, Palm and Windows Mobile phones with all the formatting and images intact. If your phone doesn’t support MobiPocket, the Java TequilaCat Reader is a good alternative, although you will lose the images and bold and italic formatting. You can order Pearls Vol 1 from Tomi’s site at tomiahonen.com/ebook/PearlsV1.html for €9.99 EUR. Payment is with PayPal and delivery is by email. The site also has some free excepts from the book if you want to get the flavor of the book before commiting your €9.99. This entry was posted in Books and tagged book review, Mobile Advertising, mobile marketing by Dennis Bournique. Bookmark the permalink. I’m considering about acquiring the Amazon Kindle 2. I’ve read tons of reviews and am wondering what you’ve to say about it. The Kindle sounds like an amazing notion. Saving trees, saving funds, not losing your spot, print size modify, and the notes feature. So what do you believe? Need to I get it? Why buy and carry a second device? You can read eBooks on most phones with free software.